Please be aware before finalising your order that the 393 page Guide Booklet is only available as an Ebook version and is not supplied as a hardcopy or emailed softcopy. Please read further for more details. Every deck of 56 cards comes in its own rigid box and custom flax pouch. Each card is printed on 330gsm German card stock with gloss finish. Beautiful rich colours that enhance the artworks, this card set is a taonga (treasure) I'm sure you will truly appreciate! The Niu Maori Oracle cards can also be purchased via Bank deposit (for NZ customers only). ** BANK DEPOSIT = $69 ** - includes track postage within NZ. Please be aware that this is a longer process as I will need to issue an invoice. Please email me at bronwyn@bwaipuka.co.nz to purchase single (or multiple) sets with your full NAME and ADDRESS. Your details are kept strictly confidential and only used for purchasing/invoicing purposes. All prices include GST. 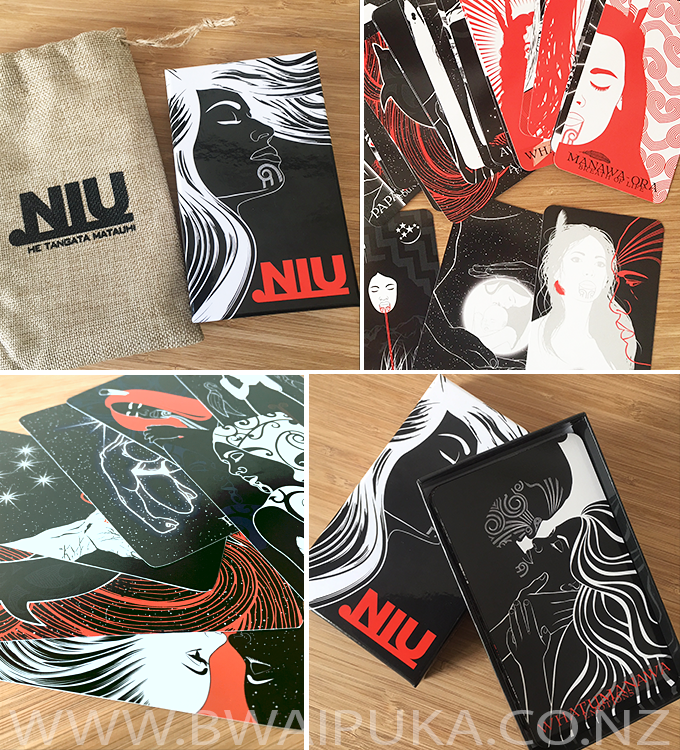 The Ebook is a comprehensive overview of the NIU Maori Oracle card set with detailed explanations of each card. Presenting over 350 pages of insightful and inspiring wisdom, it contains a wealth of Maori cultural knowledge which help to support each card's visual meaning. The teachings and guidance offered derives from a combination of mindfulness analogies and Maori cultural values and understanding. NIU Ebook can also be viewed as a PDF online Flip-Book. Click on the icon below to view ebook. **Please Note**: Use the menu below the book to view the TABLE OF CONTENTS in order to navigate around. **Links are highlighted in yellow. **Some Links may not work however, due to browser and privacy settings. **Full book is about 10MB so may take some time to download depending on internet speed and browser settings. **Sound can be turned off by using the menu also.